at the boat. He later redeemed himself with a nice 36″ Bass. Seamus got into the action with a monster Bluefish before the bite slowed. In all, there were 3 Bass and 1 Blue caught! 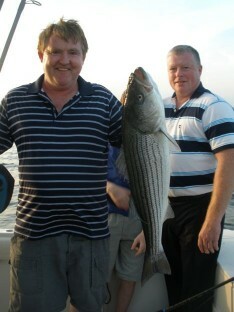 Kevin, Conor, and Declan also got into fishing, but had more success in the eating department!